The global cytology and HPV testing market has a handful of players whose moves control the dynamics of the market. Hence, the market is largely oligopolistic in nature and the actions of each of the market players is expected to invite a response from other players. Furthermore, each market player is wary of the business innovations and latest developments made by its counterparts, which reflects the sensitivity of the competitive landscape. The level of competition is moderate because the leading players do not engage in a rat race for market share and focus on retaining their current position in the market through collective efforts. Moreover, the strongholds of the leading players do not allow new entrants to establish themselves in the market, which further brings down the bar of competition. Hologic, Inc., F.Hoffman-La Roche AG, and Qiagen N.V. are the top three players in the global market for cytology and HPV testing, and they account for 86% of the total market share. Considering the adroitness of these players with business strategies, it is projected that they will continue to dominate the market over the coming years. Transparency Market Research (TMR) ran an analytic drill to understand the dynamics of the global market for cytology and HPV testing. The market value in the year 2015 was US$7.9 bn and is projected to settle at a value of US$10.5 bn 2024-end. The market would expand at a sluggish CAGR of 2.9% over the forecast period from 2016 to 2024, and hence, no significant growth in revenues could be expected over the given course of time. Based on geography, North America is anticipated to register a CAGR of 3.30%, which is prophesized to be greater than the growth rate of all other regional segments. Cell testing and analysis has held immense utility for the medical and healthcare sector due to the diverse applications of cell culture. This has played a crucial role in bringing cytology testing to the fore over the past years. The rising incidence of various types of cancers has compelled healthcare experts to engage in core research and development in the field of oncology. This has also given a boost to the demand for cytology and HPV testing and has created growth spaces for market vendors. The need for early diagnostics is another factors that is expected to propel demand within the global market. 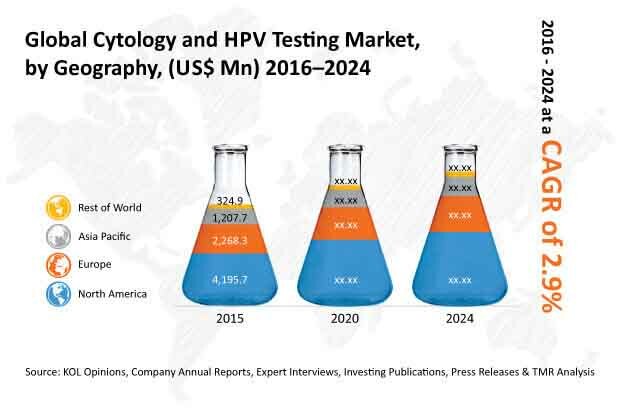 Despite the aforementioned market drivers, the growth of the market for cytology and HPV testing could be hampered by the lack of awareness about cytology testing in certain regional pockets. The high incidence of cervical cancer coupled with the rising awareness about cytology testing in North America has propelled demand within the regional market. The government along with several private organizations has aided the domain of cytology and HPV testing, which has further enhanced the prospects of growth in North America. In Asia Pacific, the availability of cheap labor is expected to contribute to the growth of the regional market.